It’s sad but true, I have reached well into my 5th decade (no! surely not.. you’re right, I don’t look it) and have never owned a bike or even learnt to ride one. For the past 4 years I’ve owned a recumbent exercise bike and cycle on that 6 – 10 miles a day but I’ve always wanted to ride a bike. Partly because we live less than 1/4 mile from one of the most beautiful parks in London – Bushy Park and partly because when I met Tim he was an avid cycler who raced and cycled 40 miles a day. He stopped because I didn’t know how and despite trying occasionally over the years we discovered I didn’t have much sense of balance but more importantly i’m short. Not petite, just short. That means my legs are short, my torso is short, my arms are an OK length which is surprisingly of little use in life. Basically finding a bike I could get on and then stop without falling off has proven difficult. Our last attempt about 10 years ago where I used his old bike went spectacularly wrong and it’s taken me this long to get up the nerve to try again, or I’m finally at the age where I simply don’t care about looking stupid. So some friends on Facebook very kindly gave me advice, the crux of which boiled down to “get to a bike shop”. Well there’s a great bike shop 100m from our house called Burts Cycles, it’s been there for over 100 years (60 years in the same family) and Tim remembered it from when he was very little. Sadly not fondly. He can’t remember why but for some reason he never wanted to go there again. So I found another bike shop about a mile away and off we went this morning. I won’t mention them by name here. They were awful. I had wondered about getting a folding bike because from what I’d seen the stepover was nice and low and initially at least we only wanted it for cycling a few miles in the park. The guy dismissed that as worthless (folding bikes are no good apparently) and then proceeded to try and push me to buy a “Giant” bike that was clearly no good for me (but great for him at 600 quid). I struggled getting on and off and as I tried to explain to him my problem he kept saying “well you won’t get anything smaller you’ll just have to practice”. Suitably chastised, embarrassed and deciding that bike riding really wasn’t for me we left. On the way home we passed Burts Cycles and I asked Tim to stop. This is a wonderful bike shop. I explained my shortness problem (you know, in case he couldn’t spot that) and he showed me specialist frame builders who build for a smaller frame, then gave me a 75 quid 2nd hand fold up bike to try getting on and off and suggested I walk it round the corner to the car park and try it out. That was great – I could get on and off it easily and even managed to cycle a bit and stop without crashing. We came back to the shop all excited and he then directed me at another bike that was on special offer with a similar low step over but new and even had a basket (what! don’t look at me like that, I want a basket). Again I tried it out and loved it so we bought this beauty.. my very first bike. 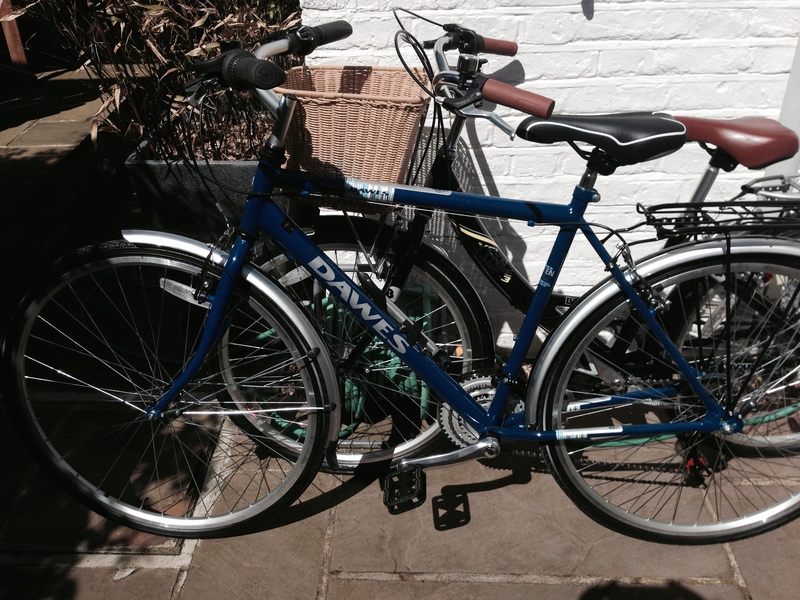 Of course we then realised Tim would need one too and once more Burts Bikes were fantastic – when Tim pointed at a bike he liked the guy said “yes that’s nice but you don’t need to spend anywhere near that much if you’re just cycling casually, this one is half the price”. Again a quick test run and we both ended up walking home with shiny new bikes. Of course we now have to go back and collect the car…. This entry was posted in Thoughts.. and tagged Misc. Bookmark the permalink. Excellent! I have never biked as more than a hobby, but loved it as a kid. A few years ago, I had to shop around for a bike that would work (rather the opposite problem, but similarly challenging), and now have a bike I can ride around our park and local streets. I think you’ll enjoy it more and more as you get used to it. Good for you to take the plunge (and keep trying after the first bike shop turned out badly). Hang on; you “ended up WALKING home with shiny new bikes”?? What about RIDING them home?? Anyway, congratulations on your acquisitions! Funny. My daughter never learned to ride a bike growing up in hilly Connecticut in the US. Her boyfriend had to teach her after she moved to London. In her case it was concentration not body style that was the issue I think. I remember being ever so excited about getting a new bike. Chopper, Grifter, Racing Bike. Congratulations maybe some day in the future we’ll do the London to Cambridge bike ride and I’ll give you a lift home (Jason). I am glad you had a good experience in the second store, and that you actually stopped there. I used to bike all the time when I was young, both in the city (even biking to/from school in the summers) and at our summer house. I regulary biked to the store for my mom when we need some last minute items for lunch or dinner, and of course when I was going over to my friends. 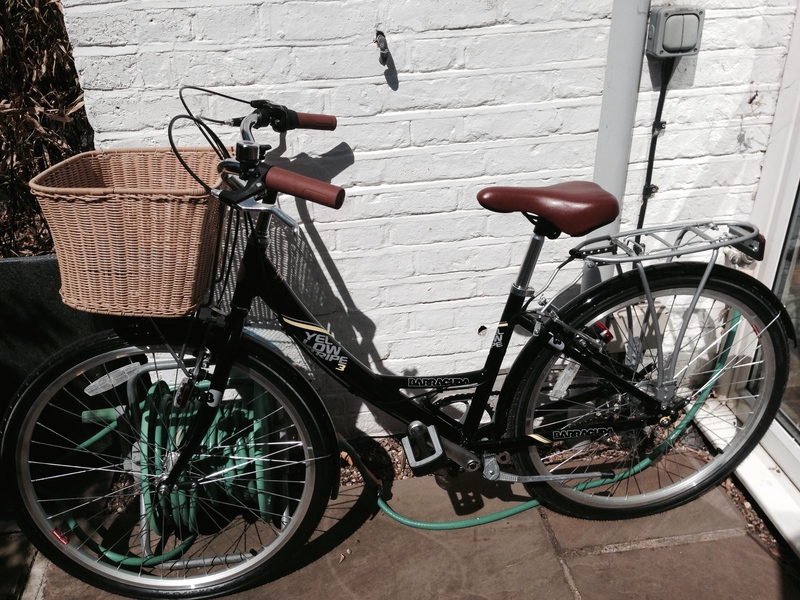 Lovely story Gabriella, maybe I should take up biking again…..